Using the Analog Expansion Board is very simple. The AEB4/8-O operates like any other DA-converter with ADAT input, except that it is connected internally. Therefore 'Force Adat' should be activated in the DIGI96 series Settings dialog, to guarantee an ADAT output signal. The card's optical ADAT output always works in parallel to the analog output of the AEB4-O. Two jumpers allow to choose, which of the 8 ADAT channels will be present at the 4 analog outputs. 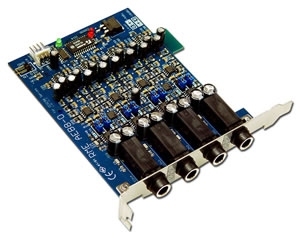 Cards of the DIGI96 series include a freely assignable analog output. Therefore PST, PAD and PRO offer a total of 6 analog output signals with the AEB4-O. Two AEBx-I and two AEBx-O or two TEB can be connected and operated simultaneously, in all possible combinations. One TEB can be used together with either one AEBx-I or AEBx-O. One AEBx-I and one AEBx-O can be connected and operated simultaneously, in all possible combinations. Or one TEB. An operation with the Hammerfall or Hammerfall Light requires board revision 1.5 or higher, because the internal connectors ADAT1Out, ADAT2Out and ST7 were not implemented in earlier versions. One AEBx-I and two AEBx-O can be connected and operated simultaneously, in all possible combinations. Or one TEB and one AEBx-O.